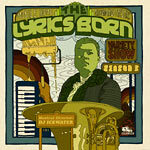 The third in the series of Lyrics Born's Variety show! A non-stop collection of rare mixes, collaborations from other projects and guest appearances as well exclusive tracks to this release. Longtime fans won't want to miss out, as each Season has been limited and hard to come by as of late! Featuring tracks with Chali 2na, Pigeon John, Tommy Guerro, RJD2, Del, Gift of Gab and more! All collected on one release for your convenience. 16. This Is What We Fought For?